The Technology Commercialization Office strives to enhance research, innovation, and the entrepreneurial spirit among the George Washington University (GW) research community. This event provides a forum for idea sharing between GW researchers, entrepreneurs, and members of the venture community, as well as the opportunity to present technologies to a panel of experienced entrepreneurs, investors, and industry professionals. TCO showcases promising and impactful GW research with commercial potential. We feature a poster session from which a panel of experienced entrepreneurs, investors, and industry professionals will select the top technologies to advance to pitch in front of the judges and audience. The best pitch in the "Physical Science" and "Life Science" categories will each win prizes for development and market research. The awards aid researchers in creating a prototype/proof-of-concept for their respective technologies. All are welcome to attend event, but participation in the competition is by invitation only. Email [email protected] to disclose your invention (must include a GW inventor). TCO will evaluate your invention and decide whether to file a patent or copyright. The invention must be available for licensing, but not yet licensed. TCO sends an invitation to compete and inventor accepts before October 5th. 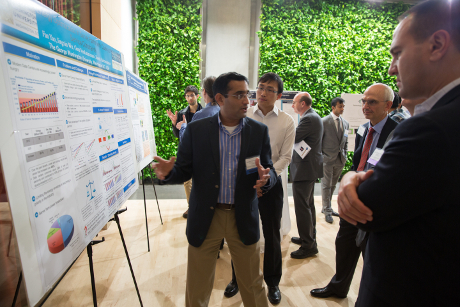 A judging panel of distinguished entrepreneurs, technologists, and investors reviews each presenting poster and narrows the submissions down to the finalists. During the poster judging, the attendees have an opportunity to listen to a brief seminar. In 2017 guest speaker James G. Clessuras, J.D, Partner of Intellectual Property Wilson Sonsini Goodrich & Rosati discussed various funding sources available to researchers and startups. Our past seminars have featured: Nancy Vorona, Vice President for Research Investment and Sean Mallon, Senior Investment Director from the Center for Innovative Technology Richard Bendis of BioHealth Innovation, Dr. Ruth Shuman, Ph.D, Program Director for the Small Business Innovation Research Program, National Science Foundation and Jim Chung, Executive Director, GW Office of Entrepreneurship. The speakers focus on various hot topics for the research commercialization community nationwide. The session is followed by a round of presentations by competition finalists, which culminate in judges allocating prize money that supports GW technology development. Runners Up were Dr. Zhenyu Li for his Handheld Medical Diagnostic System and Dr. Hasan Goktas for his Novel Resonator Cell for Portable Biosensor. Runners Up were Dr. Volker Sorger with his Electro-Optic Modulator and Drs. Adam Corman and Neal Sikka with Sonostik: Ultrasound Assisted Catheter Placement technology. $10,000 Award - Dr. Nan Zhang - DeepWebWatch, formerly known as WiseAgg. DeepWebWatch is "the Google for analytics - i.e. for people who want not only individual webpages but also a birds-eye view of the entire deep web sphere." "Researchers Showcase Technologies with Commercial Potential"